How can I set up a musical group for residents in my care home? Groups that engage residents in singing, dancing or music are becoming common in care homes, and are likely to have health and social benefits for many people. 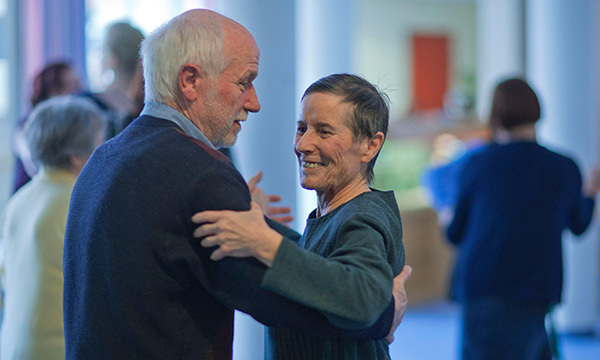 There is evidence that engagement in these activities can benefit the well-being and movement of individuals with Parkinson’s disease, for example, and they may also be of interest to residents more generally. The motivation to set up these activities often comes from an enthusiastic member of staff or a resident with a specific talent. As with all new ideas it is worth discussing your suggestions for an activity with residents and their families to see what the uptake is likely to be. While many people are prepared to try something new, it would be useful to start an activity that residents are keen to do or that they remember fondly. One such activity is the Singing for the Brain initiative, which is intended to bring people together to sing in a social environment. The Baring Foundation’s report on creative care homes, Creative Homes How the Arts can Contribute to Quality of Life in Residential Care, is also a source of inspiration and guidance. Engaging your local community can be particularly helpful in developing activities in care homes. Music groups, churches and dancing organisations can often help with planning, and may offer facilities, instruments and music. Some may even offer to help establish the group. As we approach Christmas singers or musicians may come to your care home to entertain the residents. These groups may be happy to support the development of an activity. Some residents may be unable to state their preferences, but discussions with people who know them well may elicit past interests or skills that could be incorporated into their care plans. Previous assessments by specialist nurses, speech and language colleagues or psychologists may indicate if busy group activities or complex sound are appropriate for them. There may be a need for skilled clinical judgement in assessing how a person responds to a group activity. This close observation of verbal and non-verbal communication during and after the session will help confirm whether the activity is having a positive effect. Activities must have the support of your organisation, and various governance processes, such as risk assessment and staff training, will be required. It is also important to consider how you will evaluate the activities from the perspectives of individual residents and the care home. As the evidence base for the benefits of artistic engagement grows, nurses should consider incorporating activities in a therapeutic and individualised way to benefit residents and staff.